We are a community partnership of 16 gardens that are teaching and learning resources helping local students and households to reclaim the skills, tools, and knowledge needed to increase the availability of local foods. 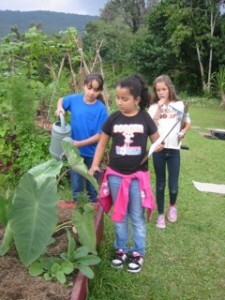 Garden projects began in 2011 and in 2013 a family component launched a new initiative to improve access to homegrown food and healthy nutrition. 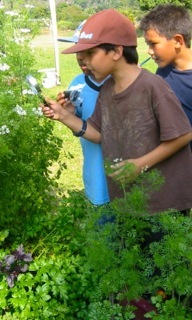 Over 105 Island households applied for funding to create or improve a food garden. In turn, each applicants shares the results of their project with at least eight neighbors or family members. To really attain a long term, stable, local food system, our food system efforts need to include our schools, community non-profits, churches, farms, businesses, and households in a universal campaign to grow and distribute more local foods. 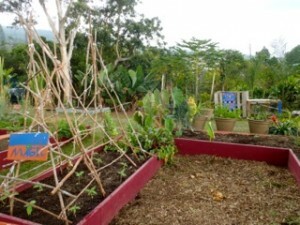 In response to this community-wide food system goal, the One Island Sustainable Living hosted The Same Canoe Community Garden Project, 2011-2015. The Same Canoe Project recognizes the food security risks we face on the Island of Hawaii, where 85% of our food is imported and there is only a 3-5 day supply of food on hand in the entire state. In response to these challenges, Same Canoe has been focused on growing more local food, bringing farms, businesses and schools into fertile partnerships, and hosting monthly Good Medicine garden volunteering days. Our original goal was to help at least 12 community gardens in their creation or restoration projects, including food production, wildlife habitat and native reforestation efforts. We expected to bring over 5,000 pounds of local produce to local homes through these gardens by October 2013. The Community Gardens were intended to serve over 1200 local residents by providing educational resources and experiences that encourage broader local support for locally grown foods – in their own backyards and in their shopping choices. We also offered mini-grants to at least 105 households who attended a training workshop and proposed a new or expanded food garden installation for their household. Accomplishments to date: 16 community gardens enrolled in the project – exceeding our one dozen goal. Over 8,000 pounds of produce has been brought into the community through our farmer and gardener affiliates and associated gleaning projects. Help out at a community garden near you and share your appreciation for locally grown food. Students and Teachers at island schools love having garden helpers who not only weed and water, seed and plant, they also do art projects and snack programs that could always use your help! Non-profit organizations need volunteer help for their gardens too. Donate excess produce to Same Canoe through the No Fruit Left Behind gleaning project. We’ll help get it to families need. Make a finanical donation to show your support for the front line work going on in our partner community gardens – 100% of donations buy supplies for gardens! 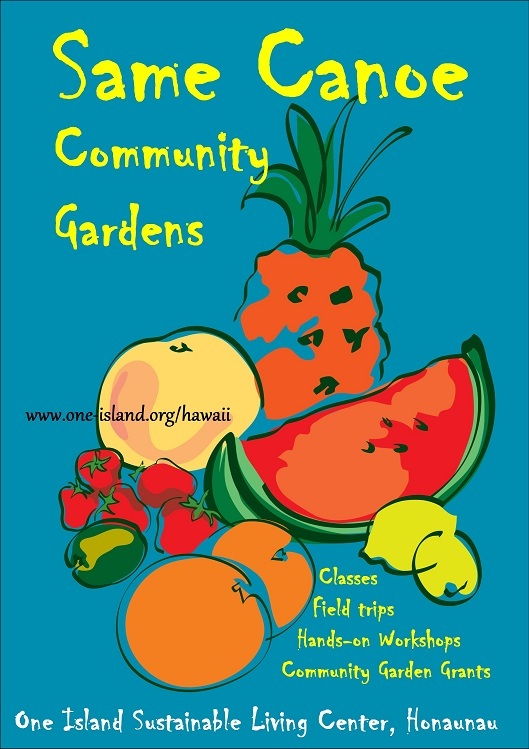 There are schools and non-profits in West Hawaii neighborhoods that invite your help in building and maintaining their community learning garden. You can volunteer a few hours a month and make a REAL difference. 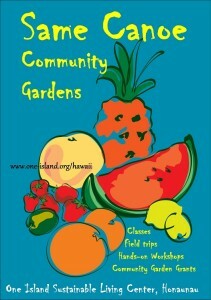 One Island hosts volunteer days at our farm and gardens in Honaunau, and we coordinate volunteer crews to help out at a local community garden sites.We encourage you to contact your local garden and book your own volunteer activities. Sixteen schools and non-profit organizations received a package of professional development, garden grant funding, and/or community organizing services from One Island and exceeded our original goal of creating or revitalizing at least 12 community gardens in West Hawaii. Same Canoe’s support for these gardens was funded in part by the PEOPLE’S GARDEN PROJECT hosted by the National Institute for Food and Agriculture. The lead gardens served as demonstration sites sharing local food production, preparation and preservation knowledge with their clients, students and families. The project created a wide ripple through the community and served over 2,000 rural residents interested in increasing their food security, improving their nutrition, and saving money by lessening their dependency on imported foods. In addition to growing food, The Same Canoe Community Garden Project provided support for increasing wildlife habitat, promoting reforestation and preservation of native plants, and growing medicinal plants. Green is a Verb – Let’s Do It,Together!